Visiting Valencia was a wonderful experience; after a 3 hour train ride we arrived. We already knew that there was a chance that it was going to rain, but we were happy that the weather was clear with only a few clouds. Once we got out on the main street we were able to navigate quite easily as it circles around the whole town, as we began with the Plaza de Toros as our first stop. While we were walking, one of the first stops we made for souvenirs was for this lovely comic book shop that we found, Futurama, on the Avienda de Guillén de Castro, so we automatically crossed the street and went in. The shop was very spacious and with so much to see, with comics from wall to wall. After making a quick look, we bought some comics and headed out to continue our trip. Travel Tip 1: If you are arriving from the train station Joaquin Sorolla, take the bus to the Estación del Norte (North Station) which is exactly where you want to begin; this saves you time instead of walking and its free. Travel Tip 2: Make sure to pick up your free map of Valencia in the information center inside of the train station, so you won’t get lost. With all the walking that we were doing I was happy when we found a market, Mercado Central. We were getting hungry, and after walking up and down every section of the market seeing what we could eat, we found an older man that was selling empanadas; it was so delicious, and it was filled with sausage. And to top it off we walked right around the market place and we were on the street, Plaҫa de Mercat, which has beautiful gothic landmarks like, La Lonja, from there we went to the Plaza de la Reina. But, before we left we got some delicious chocolate filled croissants at this bakery on the street, I forgot the name of the bakery but the building was like a cake slice, right outside the market. Valencia is unlike other towns that we visited, it has a pleasant charm. All the streets seem look the same that are around the Calle de San Vicente, and we kind of got lost for a little bit once we got really deep into the town. As if we were in a never ending maze, which we weren’t the only ones. Everyone we saw that came with us on the train seemed to be going around in circles as well, searching for a way out to get to the main plaza, Plaza del Ayuntamiento. From there we just had to go to the outskirts of the town, because the outside the town there is a giant park that wraps around and divides the central part and the outer part of Valencia. One way leads you to the Valencia Zoo, Bioparc, and the other leads to the City of Arts and Sciences. As you approach the area, it’s as if you have been transported to the future, with such astonishing architecture. The water that fills the pools that surrounds the buildings are so blue and with the white from the buildings, just speechless. When we were there they were setting up for the premier of Tomorrowland. 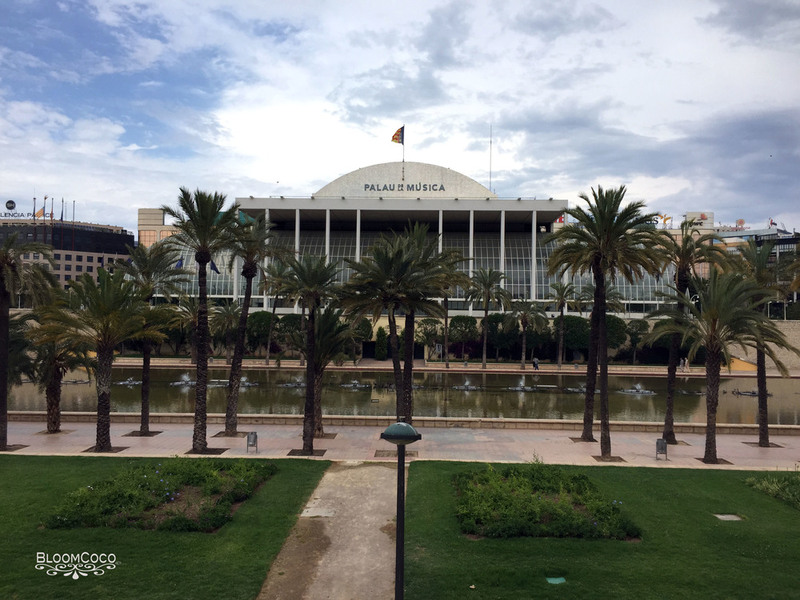 We continued walking, and crossed the L’Umbracle and went past the L’Agora and the Planetarium all the way down to the L’Oceanogràfico. We went back to where the premiere was going to be held, but then it started to sprinkle a little bit and we decided to head back since we had to catch a train back to Barcelona. Since we still had a little more than an hour we decided to walk back to the train station instead of getting a taxi. As we were walking back Erik jokingly said, “…you call this rain, this is nothing”, then all of a sudden it started pouring rain and then we were drenched. We had to call it quits because we had to cross a bridge to get to the train station but the only way to get across was by car, so we called a taxi. Which, will always be a great memory; running through Valencia to get to the train station in the pouring rain. Travel Tip 3: There’s a McDonalds in the main plaza, if you ever have to use a restroom it’s probably the cleanest one in town other than the train station. You have to make a purchase first to use it to enter a code, or you can just wait for someone to exit the restroom area and use it for free. Travel Tip 4: Always try to get the meal of the day for the restaurants in town, it’s the better deal, cheaper and more to eat. Travel Tip 5: Pack some snacks in case you or your loved one gets hangry. Travel Tip 6: Don’t forget to pack your umbrella for your day trip in case it rains; always check the weather forecast for the day. We were a bit hungry by the time we got to the station so we got some pizza that had some mixed vegetables for toppings, which was delicious. When we arrived at Barcelona it continued to pour there, and we had to wait in line to get a taxi. From there we got dropped off at Las Ramblas and ran through the rain through our shortcut to get to our apartment building and although it was already midnight there were still so many people out and about in the same situation trying to get out of the rain. The store was really big and there were so many comics all around in every wall ! Church of St. Ursula !